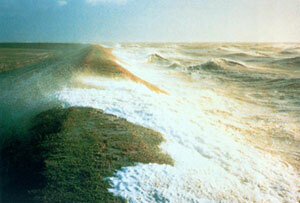 Waves on the coast of England, Hartlepool. By abundant rainfall or large amounts of snow, the water in a river or reach more dangerous heights. Storms can make the sea surge and make the waves ride high. A flood hazard does not always cause a flood. Perhaps the storm does not reach the coast. Perhaps the dunes can defend the land against the water. A man-made hazard will mostly lead to disaster only when it takes place under severe weather conditions. A sea lock that doesn’t close may not cause that much trouble at low tide, but it may at high tide or in a storm. A storm surge barrier that doesn’t close when it is tested on a sunny doesn’t cause problems, but if it doesn’t close in a severe storm surge it does. Here you can see a presentation on natural hazards.